I am trying to use a few algorithms that may be useful for my work, that are part of the processing tools packaged with the latest LTR 64-bit version of QGIS in Windows 10 64 bit.. However, all of the SAGA algorithms that I have tried so far throw the same final error, regarding layers that were not correctly generated. The following image is the end of the log message I get. In red is the error I mention. It happens with all tools I have tried so far. I checked other posts and read similar issues. Some suggestions to fix it included using different paths, and avoiding blank spaces in them. I tried changing the path to a D:\Temp directory but no success. In the log, some paths appear with forward slash (/), as in Unix systems. io_gdal 0 -TRANSFORM 1 -RESAMPLING 3 -GRIDS "C:/Users/Kais/AppData/Local/Temp/processing_5080f69b88474281943ae5c46597245d/635ead2d3ee34f7bbeda0d5905c407b0/DEM.sgrd" -FILES "F:\Dropbox\QGIS_Test\DEM.tif"
ta_profiles "Profiles from Lines" -DEM "C:/Users/Kais/AppData/Local/Temp/processing_5080f69b88474281943ae5c46597245d/635ead2d3ee34f7bbeda0d5905c407b0/DEM.sgrd" -LINES "F:\Dropbox\QGIS_Test\Lines.shp" -NAME "id" -SPLIT true -PROFILE "C:/Users/Kais/AppData/Local/Temp/processing_5080f69b88474281943ae5c46597245d/8d34e08d5a984c11a8ffce8b99fadd36/PROFILE.shp" -PROFILES "C:/Users/Kais/AppData/Local/Temp/processing_5080f69b88474281943ae5c46597245d/acbe581a52b9406fb5db4af3292f919a/PROFILES.shp"
F:\Dropbox\QGIS_Test>saga_cmd io_gdal 0 -TRANSFORM 1 -RESAMPLING 3 -GRIDS "C:/Users/Kais/AppData/Local/Temp/processing_5080f69b88474281943ae5c46597245d/635ead2d3ee34f7bbeda0d5905c407b0/DEM.sgrd" -FILES "F:\Dropbox\QGIS_Test\DEM.tif"
F:\Dropbox\QGIS_Test>saga_cmd ta_profiles "Profiles from Lines" -DEM "C:/Users/Kais/AppData/Local/Temp/processing_5080f69b88474281943ae5c46597245d/635ead2d3ee34f7bbeda0d5905c407b0/DEM.sgrd" -LINES "F:\Dropbox\QGIS_Test\Lines.shp" -NAME "id" -SPLIT true -PROFILE "C:/Users/Kais/AppData/Local/Temp/processing_5080f69b88474281943ae5c46597245d/8d34e08d5a984c11a8ffce8b99fadd36/PROFILE.shp" -PROFILES "C:/Users/Kais/AppData/Local/Temp/processing_5080f69b88474281943ae5c46597245d/acbe581a52b9406fb5db4af3292f919a/PROFILES.shp"
Las siguientes capas no se generaron correctamente.<ul><li>C:/Users/Kais/AppData/Local/Temp/processing_5080f69b88474281943ae5c46597245d/8d34e08d5a984c11a8ffce8b99fadd36/PROFILE.shp</li></ul>Puede comprobar el «Panel de mensajes del registro» en la ventana principal de QGIS para encontrar más información sobre la ejecución del algoritmo. There are some problems with the Profiles from lines algorithm in QGIS. Let's see first how it should work. If you want to save Each Line as a New Profile, you need to use the -SPLIT and the -PROFILES options. Files will be saved as profile_01.shp, profile_02.shp, etc. If not, don't use -SPLIT option and use -PROFILE option. File will be saved as profile.shp. Both -PROFILE and -PROFILES options are always used, so one of them always returns an error (The following layers were not correctly generated.). If you tick on Each Line as a New Profile (is ticked by default), -SPLIT option is used, and the files are saved as PROFILE.shp1, PROFILE.shp2, etc. That produced two errors (one for the -PROFILE empty layer and other for the invalid extensions). A bug report was already opened: https://issues.qgis.org/issues/21294. Meanwhile, a possible workaround is to not use the Each Line as a New Profile option (untick it) and ignore the error generated by the -PROFILE over option. Not the answer you're looking for? Browse other questions tagged qgis saga or ask your own question. 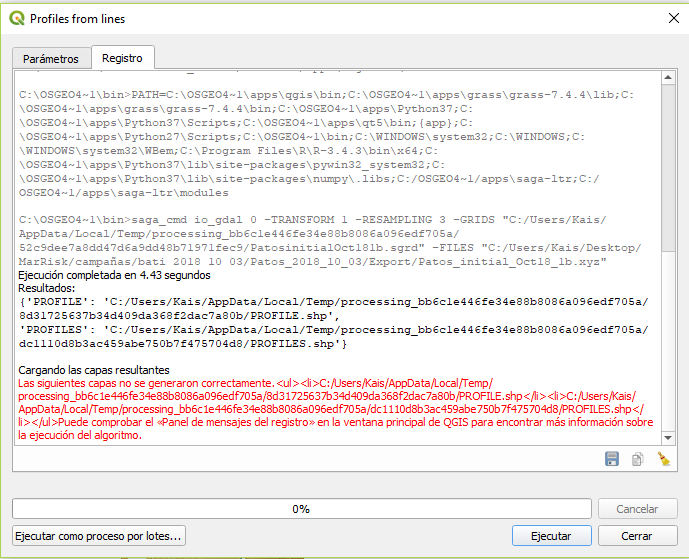 while running fill sinks in QGIS 2.14.6 i am getting this error..what is the reason?